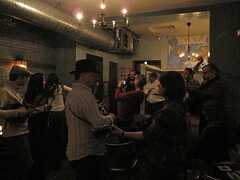 I didn't bring the good camera, but Doug Hatt (in Hatt in photo) held a great birthday jam at Nolita House on Monday night. It was strange to be there when it was dark outside, but the music was great, Doug's brother came in from Michigan (and quite a few people waved at him repeatedly until they realized he was not, in fact, Doug), and we played until last call. And a lot of special guests. 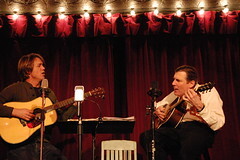 Bob Jones and Boo Reiners, otherwise known as the Plunk Brothers, had a CD release party at Jalopy last night. Their first set consisted entirely of songs from their brand new CD, Two Guitarists and a Microphone , which is not available online yet but hopefully will be soon. It's 40 minutes of wonderful guitar duets and harmony singing. 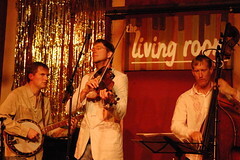 Their live shows are a joy to watch and that spirit comes through on the recording. 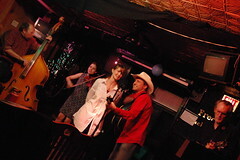 In the second set they invited a series of guest stars up to play with them, including frequent singing partner Jen Larson, and also Trip Henderson, Ben Fraker, Elena Skye, the Sheriff of Good Times, and me. It was great fun and a great honor to play with them and a wonderful night overall. Yes, I'm a Del Rey groupie. Last night I went to the Good Coffeehouse in Brooklyn to see my second show this week -- even though Bruce Molsky was playing at Jalopy and Trip and Emily were opening. Del is not nearly as famous as she should be. You could pile every well-known living blues guitarist on one side of a balance scale, and put her on the other, and they'd all have to be scraped off the ceiling. 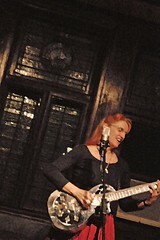 She's a complete master of traditional fingerstyle guitar, but takes it to all sorts of places that the originators of that style -- Blind Blake, Gary Davis, etc -- never dreamed of. 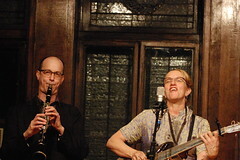 Last night, along with clarinetist Craig Flury, she played hot 20s jazz, two calypso numbers, several mind-bending original tunes, and old tunes for which she wrote new lyrics because she thought the original words were stupid. She's a virtuoso, playing sophisticated jazz fingerings with all sorts of counterrhythms and moving bass lines, all at lightning speed, relaxed and smiling the whole time, or raising an eyebrow at her guitar as if it had considered talking back to her. Her lead playing is mostly beyond my comprehension; if I could play rhythm backing the way she does I'd be happy. Very happy. Here she is doing a classic blues, and here she is doing a duet with Steve James, a ragtime tribute to many great guitarists including her hero Memphis Minnie. 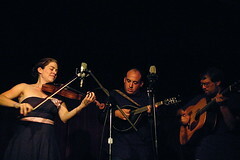 Sunday night at Jalopy was a mini-festival, starting off with the 20s and 30s blues of the Second Fiddles, continuing with more old-time blues from Eric and Suzy Thompson, and wrapping up with Del Rey's blazing guitar, salty humor and fiery blues. 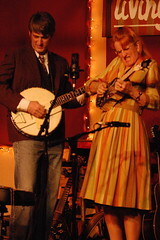 She also played a series of old blues with Suzy Thompson, whose gutbucket singing and blues fiddling went perfectly with Del's resonator fireworks. 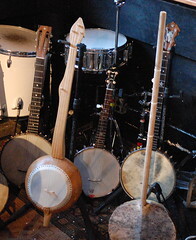 Last night's Opry was a blast, with a great song circle featuring Hilary Hawke, Andrew Schmidt and of course Dock Oscar. 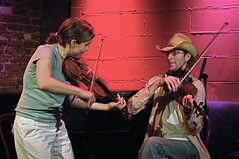 A night of furious fiddling followed, with Kari Denis joined by a fiddle player I didn't know, but who was amazing, in Old Time Amatum, the new (and so far unspellable) name of the band formerly known as Briar Patch. But under any name they're great fun. Jared Engel's bass playing was completely over the top. 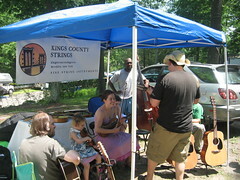 Kings County Strings followed, with special guest John Fletcher on banjo. A good time was had by all. Friday night Kate Giampetruzzi and Tone Johansen did a second great show in a week. Kate's originals, and Tone's originals and old country classics, are a fantastic combination. They were playing with great bands -- Alice Bierhorst and Walt Wells were the rhythm section for both, while Bob Hofnar and Charlie Burnham complemented Tone and Paul Cabri and yours truly played with Kate. Hopefully there will be many more shows to come! 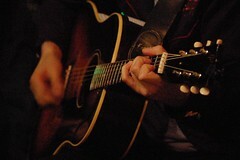 Lots more photos by guest photographer Catherine Keeter. 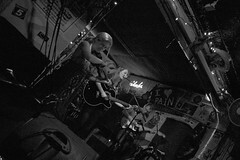 Shotgun Party, an Austin band that includes former Brooklynite Katy Rose Cox on fiddle and my neighbor Jared Engel on bass, came through Brooklyn on tour this weekend. I caught them earlier in the week when they made a stop in West Virginia while I was there, and both shows were outstanding. 68 Jay was mobbed and everyone was really into the show, which featured Jared's debut on tuba. 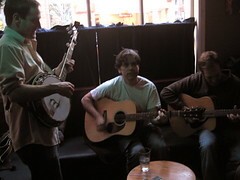 They're playing the brunch at Superfine this morning as I write, and the tour continues with a stop in Cleveland next. 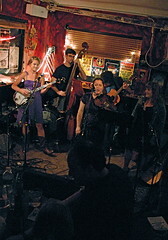 Jamie Lyn brought a great collection of country women to Banjo Jim's last night, with her own Red Tail Hawk Band, Monica (Li'l Mo) Passin playing new songs of all sorts with just electric guitar for accompaniment (along with a few guests including Bill from behind the bar on mandolin), and Melody Berger and Cat Wagon. I missed the opening and closing act but it looked like a solid six hours or so of great music. Saturday was just about as good a day as you could ask for, with mild sunny weather and musicians on every street corner. I did a three-borough bike tour, from Gowanus to Dumbo to the Upper West Side to Long Island City to Williamsburg, along the way catching Sean Kershaw and Jamie Lyn, and Jen Larson with Tony Delillo. Of course, I also missed a lot of good music too but that was pretty much inevitable. But it was the kind of day that really makes me appreciate New York City. Edith brought goodies and, most importantly, her singing voice, to the Saturday night jam at Sunny's last weekend, to celebrate her birthday. Chocolate-covered almonds and garlic-stuffed olives (which, in the lighting back there, look disturbingly identical) were in attendance, along with a great selection of pickers. Those willing to brave the crowd and the heat had a great time. 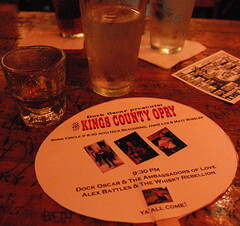 Last night's Kings County Opry was a good one, and thanks to Jamie Lyn's hard work with popsicle sticks, paper and rubber cement, everyone had a fan -- which were quite a blessing on a June night in Freddy's. 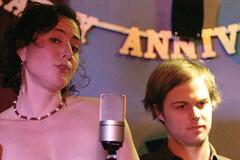 The song circle featured AJ Bender's tales of love, loss and marijuana, Joshua Sanders's high-energy originals and covers, and Ebie Carter and Dock Oscar with some great harmonies. 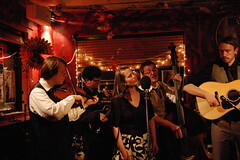 Sufferin' Succotash, a late addition to the schedule, was next with a typically raucous set on as many instruments as Shlomo can carry, with the addition of Emily Eagen on uke, whistling and vocals, and new memeber Spiff Weigand on bass, watching Dr. 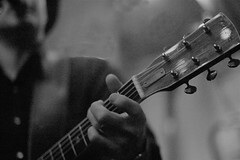 Frets for the chords and playing fantastically. 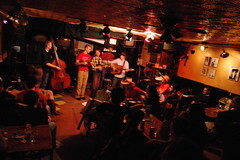 Citizen Kafka brought his collective of talented yet demented musicians back to Jalopy last night for two sets. 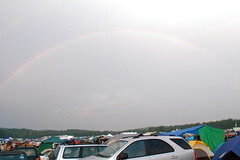 The first was packed, and Richie was in fine form, declaiming Coleridge to the tune of "Red Wing," turning the Wheels Of Karma, and writing off everything from Sunday to Buddha as "Nothing!" Dada? Nada. Nero? Zero. Oh and don't forget "Cluck Old Hen" who sits zazen. 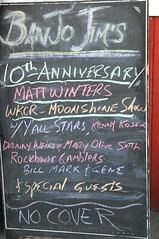 The entire East Village threw a party on Sunday to celebrate Matt Winters's first decade hosting the Moonshine Show on WKCR. 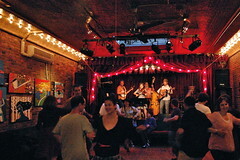 Banjo Jim's was full of musicians who'd played on the show, and Avenue C was full of a street fair, which as Kenny Kosek says, is New York City's traditional way of celebrating major events with sales of discount socks and bootleg CDs. 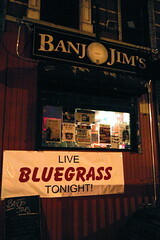 The show was a cross-generational event, starting off with the Y'all Stars, including folks like Gene Yellin and Pete Elegant, and ending with Danny Weiss and Mary Olive Smith, who met years ago at Banjo Jim's when it was 9C and the Alphabet City Opry was there every Monday night. Matt's family was there, the bar was packed, and it was a great night of music. See the complete set of photos. 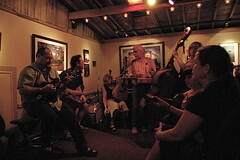 It was about 90 degrees in Freddy's back room last night, and Copper Kettle had the crowd rocking and stomping their feet (side note: how drunk do you have to be before you can't keep the beat with a bluegrass band?). Dancers were twirling, the beer was flowing, and the air conditioner had long since given up the ghost and gone outside to smoke. Fred announced casually that this was the last time this version of the band would play together, which didn't seem like news since that's been true every time I've seen the band in the last few months. But afterward, he said that he's pulling up stakes and moving to Asheville, NC. 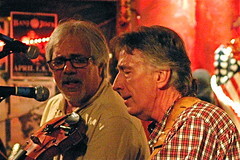 We're losing a talented singer/player/songwriter, without whom the Sunny's jam will not be the same, so farewell to Fred. Melody Berger's new band, Catwagon, followed, with some great harmonies between her, Zara Bode (of the Sweetback Sisters) and Hilary Hawke. 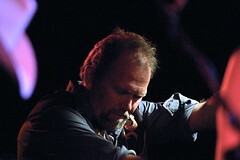 Rick (or Ricky as Melody apparently prefers to call him) Snell stood back and let the strings do the singing. 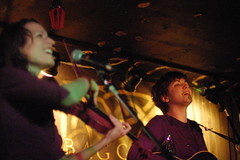 The song circle featured Dock Oscar and Ebie Carter, among other things covering the old Smiths tune, "Please Please Let Me Get What I Want," Hilary Hawke, who did originals on guitar and clawhammer banjo, and Nate Schweber, rocking out on acoustic guitar. 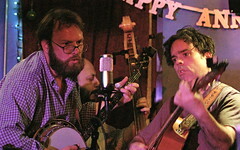 This past weekend was the second of Adam Nash's Saturday night bluegrass shows at Banjo Jim's, this month featuring Blue Harvest, Copper Kettle and The Five Deadly Venoms. Blue Harvest did a very solid two sets, featuring all of the band members on vocals at different times. 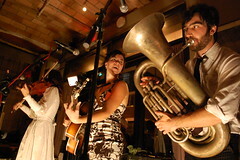 They're a solidly professional band with stellar musicians, so you can't go wrong with them. Copper Kettle played as a trio, with Fred joined by Rob Hecht and Ross Martin for a somewhat newgrassier version of the band, but their playing went well with Fred's originals and the trio sounded great. I missed the Venoms and headed down to Sunny's instead, to find a fairly quiet jam. We'll have an announcement about the location of next week's jam in Wednesday's newsletter. 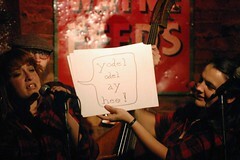 Great double bill last night at Googies, with Miz Liz and the Vipers followed by The Y'All Stars. For some inexplicable reason I haven't seen Liz's band before, but they're outstanding, sounding like a more countrified Roulette Sisters. Her singing just keeps getting better and she's put together a great band that works well together. 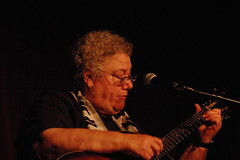 Mike Pasternak sang a couple as well, and shared solo duties with Bruno Bruzzese on fiddle and Jane Galla on dobro (and sass, according to Liz). 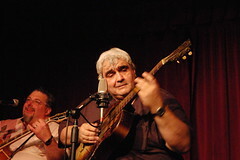 And Brett Ladin took too few solos while holding it all together on rhythm along with the inimitable Walt Wells on bass. The Y'All Stars followed with two great sets of harmonies, blazing playing, and jokes about an alleged pre-show rehearsal. But if it happened, it didn't put them off their game at all. Ben and Diane tore the place up as usual, Charles and Fran gave us the their beautiful harmonies on songs ranging from heartbreaking to depressing, even managing to get the sequence of suicides right in "Katie Dear." 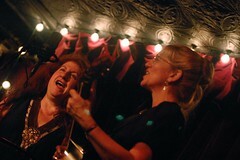 Diane sang a few and Nancy Polstein came out from behind the snare for a duet with Fran. 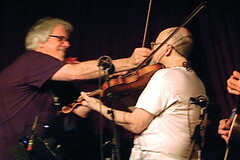 Brad Einhorn caught Andy Statman at Bar Bes on Monday night, and posted some great videos to YouTube. See below. Dock Oscar and Jan Bell brought a great lineup of acts to Jalopy last night, with Mamie Minch and elements of M. Shanghai, another set by Shotgun Party, and lots more. 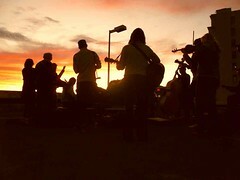 We were back at the Baggott Inn last night for another edition of the Sheriff Sessions, featuring a band from Austin, Shotgun Party, that includes fiddler Katy Rose Cox who was a highlight of the Brooklyn pickin' scene before moving to Texas a few years ago. 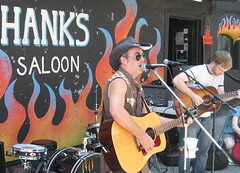 Their music lives in an area somewhere between honky-tonk or the classic blues of folks like Memphis Minnie, and modern alternative music. The instrumentation is completely traditional -- fiddle, bass and a gorgeous old archtop acoustic -- but the songs (all originals) go places you don't expect. Katy plays wicked fiddle, sometimes like horn lines, sometimes like keyboards, sometimes very dissonant, and Christopher Crepps on bass was right there with all the weird changes and unexpected turns, playing masterfully in the classic style. And Jenny Parrott is one of the quirkiest and most engaging singers I've seen in a bluegrass setting in some time, and a great songwriter. Her voice ranges from little-girlish to gutbucket blues, sometimes in a single line, and a stage presence that's hard to describe and harder to capture on camera in very low lighting. (I was using a 50mm/1.4 without autofocus, not that I'd use it anyway since the focusing light is very distracting, and with the lens opened all the way up so the depth-of-field was very narrow; as a result I have many great out-of-focus shots.) Check the link above; they're playing several more times in the area over the next few weeks and are well worth catching. 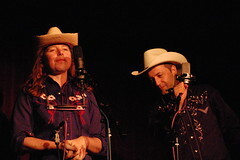 Also on the bill was Copper Kettle, which combines the talents of two excellent songwriters in the Brooklyn scene: Andrew Hunt and Fred Skellenger, and also the Sheriff's own Cheatin' Hearts, a good-time band if ever there was one.